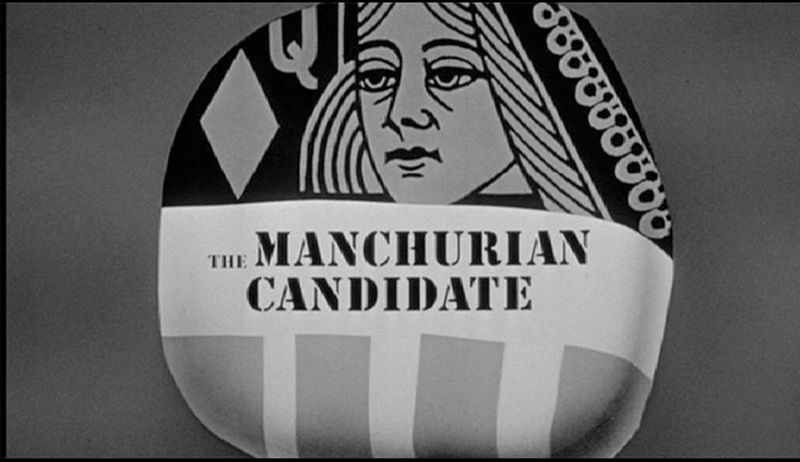 In every presidential election, the term “Manchurian Candidate” gets lobbed like a hand grenade -- by the press, and voters -- at some aspiring politico who is feared to possess allegiances beyond the American populace. Most of the time, accusations pointing out a real-life Manchurian Candidate are false, or fit into the terrain of conspiracy theories. But here we are in late August 2016, witnessing the unfurling political scandal in which one candidate for U.S. President is suspected of being “a Manchurian Candidate,” or as at least a (possibly unwitting…) conduit, for foreign (Russian) influence. The scandal broke wide on Thursday, August 18th, when the candidate’s campaign manager was fired over alleged ties to and lobbying for Russia. But the fact remains that there appears to have been -- beyond this individual and his alleged actions -- a web of Russian influences in this particular campaign, which has primarily appealed -- ironically -- to nationalists and so-called “patriots” in the U.S. on the far right wing. I point out this contemporary scandal out not to score a political point, only to note that right now, life seems to be imitating art. Fifty-five year old art, actually. The 1962 film, The Manchurian Candidate concerned a similar hard-right-wing candidate, Johnny Iselin, who was secretly (and perhaps unwittingly) the tool for Russian and Chinese communist interests. These foreign powers interfered in an American presidential election using brainwashing and murder. Today, we face the specter of Russian interference in the 2016 election, through hacking, leaking, lobbyists, and other means. 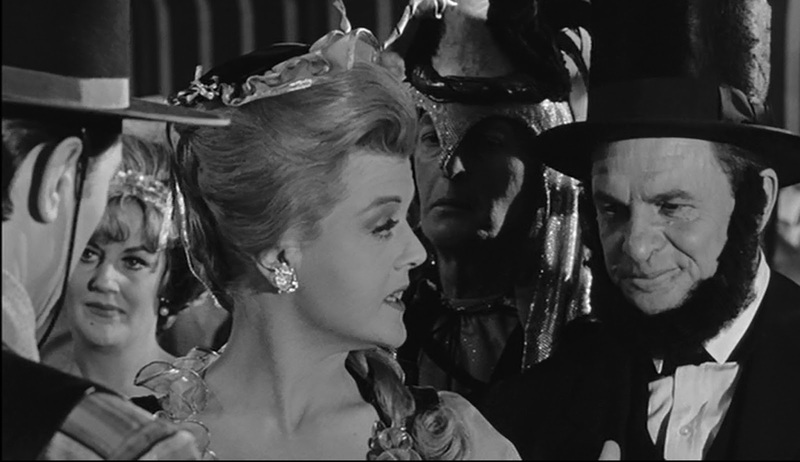 So on one hand, the film’s candidate, Iselin -- described as “a clown and a buffoon” in the dialogue -- is a McCarthy-like hunter of communists who makes rousing, patriotic speeches. But on the other hand we have the knowledge that this candidate is a craven, grasping, hapless tool controlled by insidious foreign forces that stand to benefit -- or be rewarded -- by his election to the highest office in the land. It isn’t every day that a film made more than fifty-four years ago becomes part of the 21st century national conversation, but there you have it. Back in 1962, the John Frankenheimer film (based on the novel by Richard Condon) was generally considered far-fetched, imaginative, and wild in its plot and details. Today -- with a mounting evidence pointing to foreign influence in our upcoming election -- we might view the film as prophecy; as the shape of things to come. 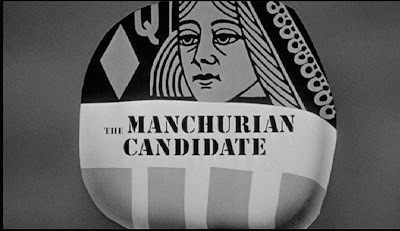 The Manchurian Candidate was remade in 2004, but it is the black-and-white 1960s effort which remains the superior work of art, in part because of the director’s careful use of symbolism (mainly images of Americana), and in part because of its use of contradictions, in terms of character and plotting, to constantly engender surprise and shock. It’s true that the film has aged some, as all works of art do. Instead of casting a Korean man in a crucial supporting role, for instance, the filmmakers cast Henry Silva…a Sicilian, in that role. When this character speaks, he does so in the kind of broken English you hear in black-and-white World War II movies. Accordingly, the performance doesn’t translate well to today’s more culturally-aware context. Similarly, there’s a talk, late in the film, of sending a Christmas card to a Buddhist that is, if not in bad taste, at least unnecessarily insensitive. These are very small things, however, when one considers the remarkable artistry of the film, and its weirdly prophetic nature. After all, consider the following: This film not only predicted the idea of a sort of right-wing double-agent running for President, but imagined -- the year before the assassination of JFK -- how a “loner” (or patsy) could possibly be harnessed to inflict terrorism on a population. In 1952, during the Korean War, a troop of nine American soldiers are captured by Russian forces, and helicoptered into Manchuria, where they are brainwashed by a scientist from the Pavlov Institute. Among those captured are Bennett Marco (Frank Sinatra) and Raymond Shaw (Laurence Harvey), step-son of Communist-bashing, right-wing U.S. 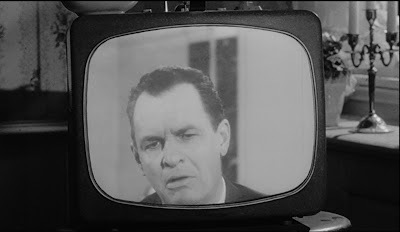 Senator Johnny Iselin (James Gregory). The soldiers are returned to the U.S. believing a false story that Raymond saved their lives. 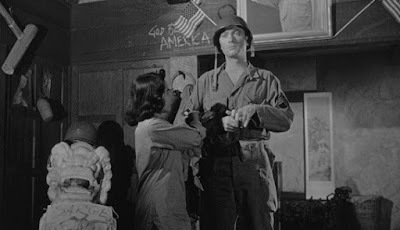 He is decorated for this act of (fictional) gallantry, but in truth, he is now an agent acting against the United States, though he does not realize it. Instead, he is triggered to obey his American handler (his mother [Angela Lansbury]) when he sees a Red Queen in a deck of playing cards. Disturbed by nightmares of his brainwashing experience, Bennett Marco investigates Raymond Shaw in his capacity as a military officer. He comes to befriend Raymond, a not very “loveable” or likeable loner. When Raymond is ordered to kill a U.S. 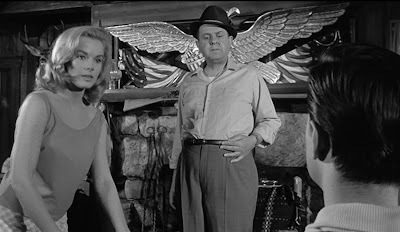 Senator Harding (John McGiver), and Harding’s daughter, Jocelyn (Leslie Parrish) -- Raymond’s new wife -- he must obey. But his hatred for his mother grows. When he learns that he is to be the assassin at a political convention, and pave the way for a “Manchurian” candidate, Raymond acts of his own accord, and earns the medal that his country awarded him. 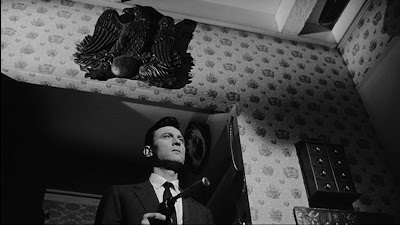 Although I have described The Manchurian Candidate as prophetic, it also takes inspiration from recent American history. The character of Johnny Iselin is clearly based on Republican senator Joseph McCarthy (1908-1989); a homegrown demagogue who made a name for himself in the U.S. Senate, and across the nation for his accusation that the U.S. Government had been infiltrated by communist agents and sympathizers. McCarthy undertook a witch-hunt to find and slime his enemies on those terms (as Angela Lansbury does in The Manchurian Candidate), and at one point claimed he had a list of “205 names” representing communist sympathizers in the U.S. Government. Later, he claimed to possess a paper with “57” such names instead. 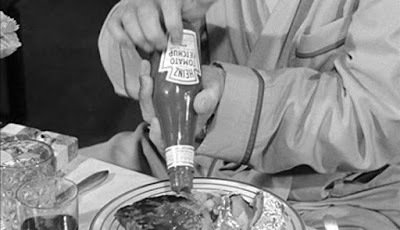 In The Manchurian Candidate, Iselin first claims “207 names” and then, after seeing a bottle of Heinz 57 Ketchup, likewise modifies his claim to “57” communists. The shift to 57 is both a biting attack against McCarthy, and a joke at the same time. The number 57 is easy for Iselin to remember because of effective product placement. It appears on a ketchup bottle. And like Heinz and its ketchup, Iselin is similarly advertising himself as a kind of brand name: a brave communist hunter! Intriguingly, the 2016 “Manchurian Candidate” I discussed in my introduction this review has pinpointed a modern corollary for this sort of witch hunt, noting that parts of America are now under Sharia law. The accusation is the same; only the face of the enemy has changed. 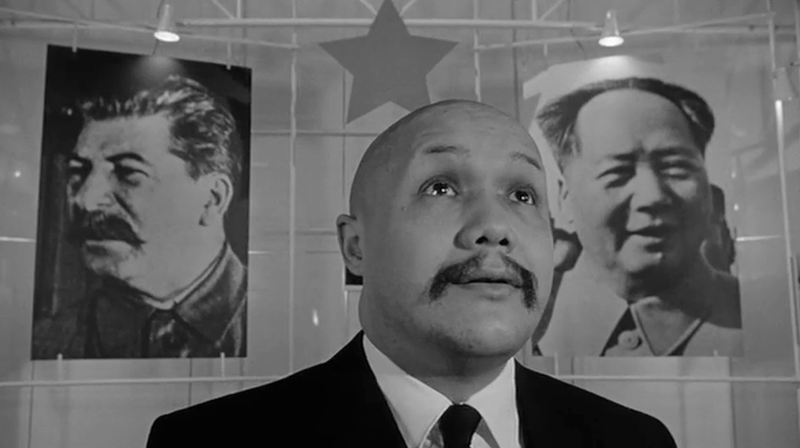 What The Manchurian Candidate suggests, via Iselin’s comical inability to settle on a particular number of communist infiltrators, is that the man is indeed a clown and buffoon, but a dangerous one who has the full attention of the national press. Reporters record and mindlessly transmit across the nation (via TV) the McCarthy-like senator’s every accusation, and that’s the point. Iselin is a huckster, but one who understands how to manipulate television and thus make a name for himself. As Mrs. Iselin notes, no one questions that there are communist sympathizers in the government after Johnny Iselin’s televised “stunt.” They only question the number of them. In political conversations and rallies, lies are accepted as facts, even without evidence, if they are repeated often enough. What The Manchurian Candidate comments on, then, is the dangerous power of the Mass Media to not only inform, but to mis-inform. The press can spread truth, or fiction with equal power. It can highlight the words of a statesman, or an unrepentant, attention-hungry liar. Many people in the audience cannot discern which they are seeing, honest patriot, or serial liar. That’s a big problem for democracy, and one not easily solved. Iselin, after all, gets the vice-presidential nomination of his party in the film, not for statesmanship, not for political accomplishments, but for his crusade to find communists in the U.S. Government, a crusade built entirely on fictional accusations. His lies are his experience. His lies are his portfolio. And he nearly rises to the highest office of the land based on those lies. As other reviewers and scholars have noted, Iselin and his wife are associated, throughout the film, with imagery of Abraham Lincoln. Not simply Americana, but specifically of our sixteenth President. Iselin’s reflection, for example, is seen in a Lincoln portrait at one point. And at a party for his son and Jocelyn, Iselin actually dresses as Lincoln. 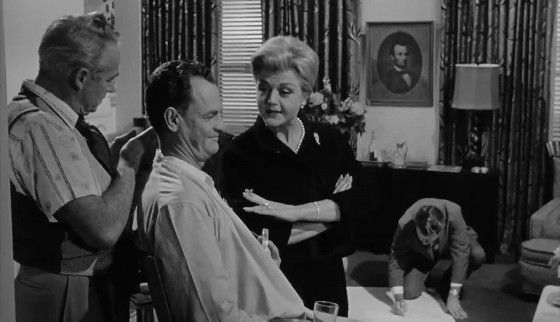 Throughout the film, busts of Lincoln are seen in the Iselin study too. Why associate a McCarthy-esque charlatan with Abraham Lincoln, a man for whom so many hold such high esteem? Well, some scholars have suggested that the Iselins have selected Lincoln as a paragon to hide behind. They have gone overboard with their Lincoln love, only to cloak their true anti-American proclivities. After re-screening the film, I think there’s more specific commentary here. After McCarthy (and indeed, today, with the nominee of 2016…), one must ask: what has happened to the party of Lincoln? This was the party that freed the slaves and ended slavery in America. How has it gone from the heights of Lincoln to the depths represented by McCarthy? How has it gone from holding the fabric of a nation together, to manipulating the press to tear that fabric apart for individual or personal gain? The multitudinous images of Lincoln throughout the film remind us how the noble have fallen, how a party has fallen from greatness. It’s not just that the Iselins’ hide behind Lincoln, it’s that they use his party as a base from which to launch an attack on the greatness of our nation. They appear to be extreme patriots, and are, in fact, betrayers. 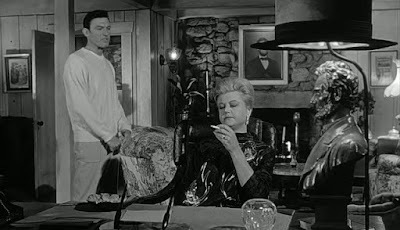 The Manchurian Candidate also associates the Iselins’ nemesis (a very responsible and noble member of the party of Lincoln, by contrast…), with a symbol of Americana even more ingrained in our national psyche than that of Lincoln: the bald eagle. When Raymond declares his desire to marry Jocelyn, Senator Harding is seen in front of a huge symbol of a bald eagle, with wings unfurled. These wings seem to sprout, literally, from his shoulders. Similar eagle imagery is seen in association with him, later. When Raymond is a programmed assassin, he crosses the threshold into Harding's kitchen to murder the senator. Over the threshold, the symbol of an American Eagle is visible. In the latter example, the symbol of the eagle showcases Raymond's point of transgression. The murder of Harding is the murder of liberty. 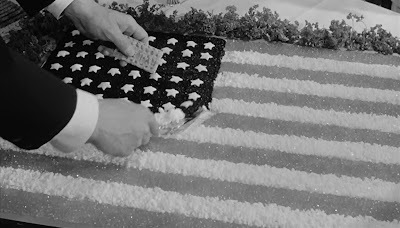 Also, consider the symbolism of Iselin wiping his cracker across the surface of a cake decorated as Old Glory, the American flag. It's a desecration. Just as Iselin's rise to office is a desecration to democracy, the Constitution, and to America. 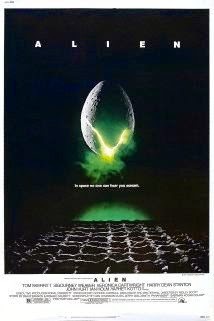 So what does the film’s symbolism reveal to us then, if taken in conjunction? The battle in the film is thus between those who stoop to exploit patriotism and nationalism, and those who understand the real, true values of America, and seek to protect it. Raymond, similarly, appears to be a loner and assassin, but he is actually the courageous savior of American freedom, appropriately eulogized in the film’s moving coda. 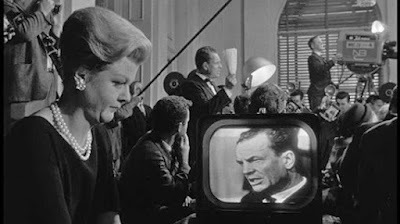 I wrote in my introduction about the contradictions in The Manchurian Candidate, and how well they function to craft this particular. Consider, in this film, we meet a man who is a bitter, nasty loner, but who desires only to be lovable. Everyone seems to hate him, and he is a pawn of the villains. But, as noted above, he gives his life to save our country. So the jerk and brainwashed assassin is also a great patriot, taking matters into his own hands when he knows the army and police are too late to act. We also meet a nefarious communist scientist/agent, who loves a good joke. He is no Fu Manchu stereotype, but a jolly man who loves a good guffaw, and encourages humor in his compatriots. He doesn’t present as dastardly, but as jovial. Similarly, we encounter a monstrous (and indeed, incestuous…) woman who hides behind the imagery of Abraham Lincoln, and calls out other Americans as communists when, in fact, she is a communist agent herself. Part of the joy inherent in viewing this film, even several times, is grappling with these contradictions, and the way they simultaneously shade and reflect character, or identity. What are we to make of the eerie coincidence that Jocelyn shows up at the masquerade party as the Red Queen, the very figure that “activates” Raymond, the wolf in sheep’s clothing? For years, many have also speculated about Janet Leigh’s character, who befriends Marco and engages in a weird conversation with him that also seems to suggest, at least tangentially, that she is a spy sent to handle him. This, my friends, is a film with layers, and the contradictions are part of that layering. We are asked to look beyond the surface, and search for the truth. And let’s face it, these contradictions are also a key part of the down-and-dirty fighting of American political campaigns. The camera records people and events, but it can’t tell us who is lying, or who is being truthful. It can’t expose the contradictions for us. Instead, the camera goes to the loudest blowhard, not the smartest or most judicious individual. Our very media, our method of discourse, appears to encourage and reward extreme behavior. The Manchurian Candidate is a well-made, well-filmed effort. Consider, the moment, for instance, at the Lady’s Garden Club, when the true nature of the event is exposed. Frankenheimer’s camera goes around in a circle. Upon the completion of the circle, the ladies have been replaced by the communist agents and audience. Or consider the karate fight sequence, between Silva and Sinatra, which is masterfully choreographed and cut, and starts with a kind of lightning bolt or shock, as Marco recognizes Silva's character. The film’s craftsmanship holds up well in terms of relating the twisting narrative to audiences, but the production’s use of symbol-laden imagery makes it a document of value and enduring truth in terms of understanding American politics. The Manchurian Candidate reminds us that the most independent, patriotic voice in the room -- or on camera -- may not, in the final analysis, be either. Great movie. Even better novel. Great work John, I hope our brief conversation in the past played a hand with you looking into this film again. Why was my earlier post removed? Was it offensive in some way?